Erica Auch is a native Georgian born and raised in Forsyth County. 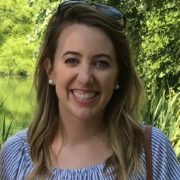 Following graduation from the University of Alabama with a degree in Food and Nutrition, Erica’s love for children led her to pursue a certification as an AMS Montessori teacher. In her four years at MASS, Erica’s greatest joy has been helping her students unlock their love of learning. After spending two years overseas, she met the love of her life, is now recently married, and has returned to teaching. Outside of school, she enjoys hiking, yoga, and mountain biking with family and friends.